Skin | My Gospel Workers | "Redeeming the Time"
glass jar/cheesecloth (or other fine strainer)Take the equal parts of ground calendula flowers, comfrey leaves and marshmallow root and mix in a bowl. Put the combined herb mixture into a glass jar and fill 2/3 full. Fill the jar the rest of the way with olive oil. Cap tightly and set the jar in a warm place for 2 weeks. Strain the oil and herbs through a cheese cloth or other fine strainer and reserve the oil. Add one ounce of beeswax per seven ounces of oil. Heat the mixture until the beeswax is melted, pour into ointment jars. This formula is great for all types of skin irritations! Great to keep on hand in your first aid kit! 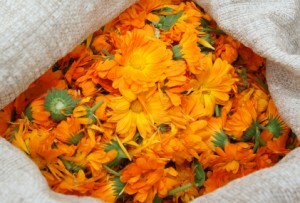 Yellow ointment started out as a simple ointment made from calendula flowers. The flowers made it yellow and that is how it got its name. It was used on all kinds of wounds, rashes and skin troubles. Later comfrey leaves were added to the ointment turning it more of a green color than yellow but it kept its name. Marshmallow root was added to the formulation and this seemed to be the finishing touch. Because this contains comfrey, this ointment is NOT FOR INTERNAL use.